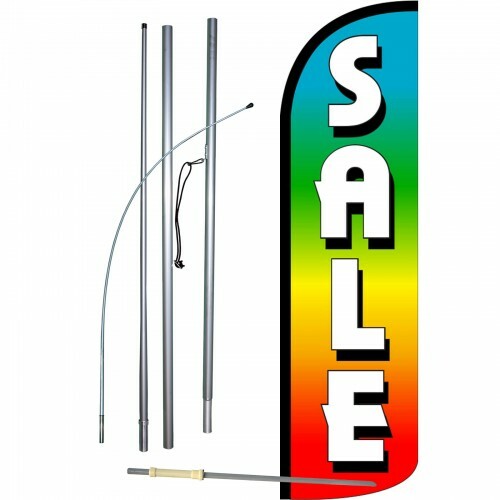 This Sale swooper flag, also called a feather banner, has a vibrant rainbow background and contrasting white letters. The message on the feather banner reads 'SALE', making this sign an ideal advertising banner. Each extra wide flag stands 12 feet tall and over 3 feet wide. The feather banner's sheer size alone can be seen from afar and is more effective at reaching customers than other traditional signs. This swooper flag is constructed from UV treated, lightweight and affordable polyester, balancing quality and affordability. The graphics are imprinted using dye-sublimation for fade resistance. Each banner is has the imaged dyed-through; this means a mirror image of the graphic is visible from the reverse side. 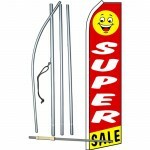 This Sale flag also comes with an aluminum pole. 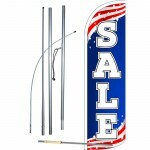 The feather banner's pole is lightweight, making it easy to transport the pole from one location to the next. The aluminum pole, pre-printed design and polyester material were all chosen due to the fact they result in a lower cost blade banner. 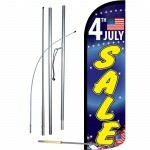 This feather banner includes a ground spike in addition to the flag and aluminum pole. The ground spike included with purchase is manufactured from steel and can be reused repeatedly. Each stake can be driven into any soft ground or grassy surfaces up to 2 feet deep, which allows advertisers to position the flag near high-traffic roadways! 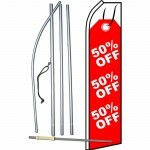 This windless bundle features a curved design to keep it standing tall, no wind needed!